One year after the first batch of rules from the Credit CARD Act went into effect, overall consumer credit card rates remained perched at 16.79 percent, almost two percentage points above the year-ago average, according to the latest survey by IndexCreditCards.com. Rates for all types of credit cards remained stable since the last survey two weeks ago, except for business credit cards (non-reward), which rose to 14.47 percent from 13.75 percent, and business reward credit cards, which dropped to 15.74 percent from 15.92 percent. Any drop in rates is good news for entrepreneurs who rely on credit cards to finance capital and help with cash flow. With commercial bank lending tight, credit cards are an important financing tool for many small-business owners. New federal rules stemming from the Credit CARD Act do not apply to business credit cards, although some issuers have voluntarily extended consumer protections, such as the ban on interest rate increases on existing balances, to small-business customers. The new rules for consumer accounts went into effect in phases, starting a year ago when issuers were required to give customers notice for interest rate increases and an opportunity to opt out of the accounts. The bulk of the regulations became effective in February, including the ban on interest rate hikes on existing balances and during the first year of an account and restrictions on marketing and issuing credit cards to young people under 21. Issuers also were required to apply customers' payments over the monthly minimum due to the balances with the highest interest rates, among other rules. This month, new rules limiting penalty fees went into effect. Late fees in most instances are capped at $25 and can't exceed minimum monthly payments, and credit card companies can't let consumers exceed their limit and charge a fee unless consumers have opted in for the service. With the growing regulation, issuers have been ratcheting up rates they offer to customers on new accounts. One year ago, the average credit card rate for new consumer accounts was 14.99 percent. To pinpoint a single average credit card rate, the IndexCreditCards.com survey takes into account all the rates offered for each card. Many issuers offer tiered rates based on consumers' credit ratings. Applicants with the highest credit scores get offered the lowest credit card rates, and those with less-than-perfect credit are offered the higher rates. The average rate for consumers with excellent credit is 11.17 percent for non-reward cards, versus 15.22 percent for the overall market, and 13.68 percent for reward credit cards, versus 17.46 percent for all consumers. The survey counts only standard rates, rather than introductory rates that are in place for the first several months of an account, or special rates for transferring balances. 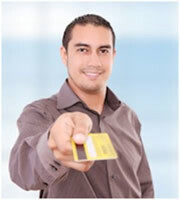 Today most of the credit card rates offered consumers are variable. They include a margin set by the credit card company added to an index, usually the prime rate. Currently the prime rate is at a low 3.25 percent, but it's bound to rise once the economy finally turns around, and credit card rates tied to that index will go up proportionately. 0 Responses to "Credit Card Interest Rate Monitor Archieve - August 31 2010"